Even though I look forward to spring by this point every winter, this year the yearning for warmer weather, more sunshine, green grass and flowers is even stronger than usual. Go home, Polar Vortex, you've made your point. But as well as rejoicing in being able to pack away all of our snow gear and actually set foot outside the house without 17 layers covering every exposed inch of skin, the kids and I are also extremely excited to reach into our closets and pull out the stylish footwear that our tootsies have been longing for. Don't get me wrong, a great pair of boots is awesome, but they somehow don't bring the same satisfaction as super cute flats or sandals. Maybe it's just because my toes are dying for the sunshine as much as the rest of me! 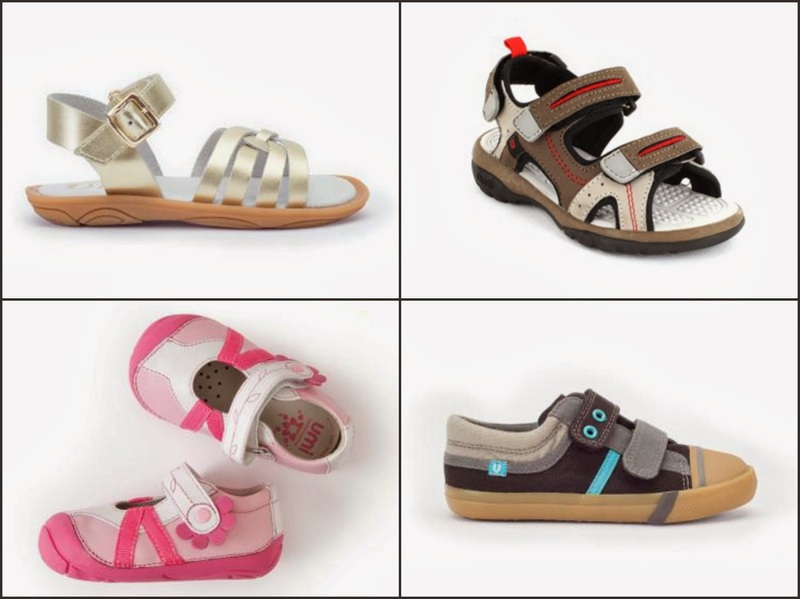 When it comes to children's shoes, the fact that there are a million pairs out there means it makes an even bigger difference to shop for ones that are well-made and designed just for growing feet. 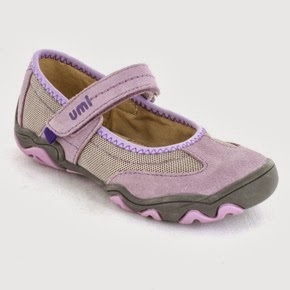 Which is why we know that to consistently find a wide selection of fashionable and top-of-the-line styles for kids, we need to turn to none other than Umi. And, although I've liked all of the past Umi shoes that my girls have worn, when the Roxanna B II in the vibrant New Blue color option arrived, I was instantly jealous that they didn't come in my size as well. Also available in silver, gold and blush pink, the Roxanna B II are handcrafted with durable outsoles and linings and the stunningly soft leather uppers feature lacy laser-cut designs that are eye-catching and attractive (and caused Big Sister E to dub these "snowflake sandals"). The sturdy construction and the flexible sole give plenty of support, yet are just right for providing traction and comfort, while the bright, contrasting zipper down the back allows for easy-on, easy-off. No struggling with buckles or even Velcro when these are quickly zipped up and down in seconds! Not to mention that the overall gladiator style is so darn trendy and fun and the way that the vivid blue and the lime green zipper and soles are just the cutest combination around. Is there a way to not smile when you see a pair of shoes this fun? As I had used Umi's convenient size chart (I even printed off their downloadable measurement chart to be sure) and knew that their shoes are handcrafted to include room to grow and fit generously, I was pleased to see that these sandals are currently just a tiny bit large on Big Sister E.
That just means that they'll be just right for her to wear them when spring finally does arrive... and then all throughout the summer and into the fall! 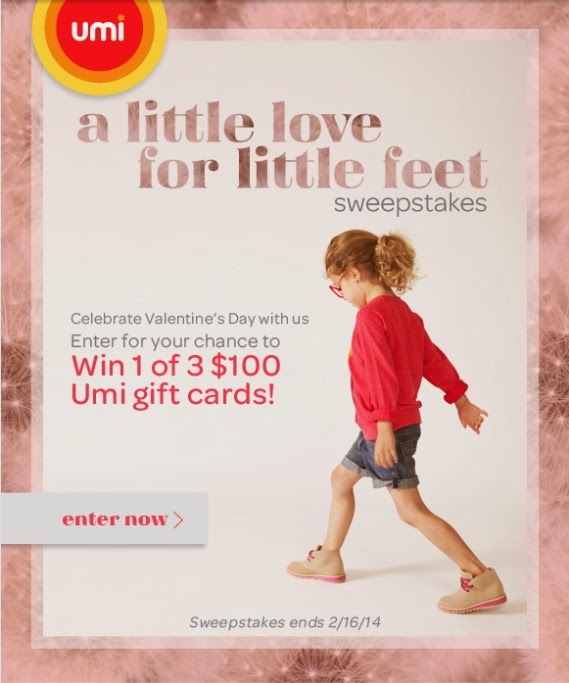 Speaking of fashion, Umi is kicking off their A Little Love For Little Feet Sweepstakes today, February 10th! 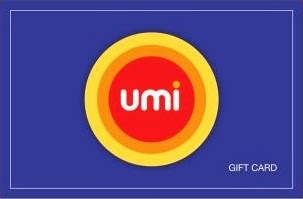 From now until February 16th, head over to their website to enter for your chance to win one of three $100 Umi gift cards! Mack II is my fave! I love,love,love, the Viola ! It's so cute and my daughter would flip over them too! love the cora ii in white for spring/summer! My favorite is the Reece in Dk Gray Multi! I like the Eva II! I like the Eeva II shoes. I love the Viola Shoe! My daughter would love it too! I really like the Pink Verity! I like the Oliver in silver! I like the Elaina II in blush pink. I love the hot pink Eeva shoes. I love the Zander toddler boy shoe in multi gray. I like Oleson, a water resistant shoe for boys in black. My grandson who loves to move would get a lot of use out of these sturdy shoes. I like the silver dyans. We like the Marisa II in Cherry. I like the Cassia girls shoes. I really love the Vianne Ballet Flats, they are so adorable! I would love to get a pair for my daughter! I Like the boys Luke! Jasmyn would be my choice! My favorite is Ranna II! My favorite pair of shoes is the Samantha. The Davan umibaby shoes are adorable! I really like the boys reece sandal! I love the Elaina B! SO cute! I like the Cassie mary jane in cherry. I love the Luke II for boys! I like the Weelie- Blue Multi shoe for babies. I like the Pink Verity! I like the Noel in White. I like the pink verity. The Celia sandals are adorable. My favorite is the Stefi. I love the girls gemma 2 sandals! I love the Quin B! I love the Eeva girls shoes! I like the Celia II for my youngest daughter. Thanks for the chance to win! My favorite is the Luke II! I love the Eeva shoes in the Gray Multi. I like the Eeva in Lilac! I like the Raymon toddler boys shoe. Love the dyan 2 in gold! I like the black Stefi. I like the Boys Luke sneakers. My favorite pair is Vance in Dk Grey, Multi. My favorite is the Viola. I love the Vance in blue and orange! My son would adore them! Elaina B in mint green - sooo cute. I love the Roxanna B II gladiator sandal in gold. I like the Samantha in fuschia. I love the Elaina B II, so cute! I like the Noel in navy. I like the Calie in red. I love the Ryder II for boys. I love the Eeva in black/multi. I really like the Braden style shoe. Thank you for another super giveaway opportunity. Please keep up the terrific blogging. The Cora sandals would look great on my girls. I like the Reece sandal for boys. Love the Roxanna B II!!!!! So Cute!! Leave a comment on this blog post telling me whether or not you think that you will go to see this movie and why. The Cassia Pink Multi Baby Shoes are my very favorite. I'd love the Reece for my toddler boy in size 9! I like the Daisy in brown and pink for girls. I'd LOVE to get my daughter the Abbie II in black! Very cute! I like the Vianne in blush pink or silver. Love the Weelie and the Hectorr shoes for my boys! I really like the Cassia shoes - they are absolutely adorable. Moraine II are my favorite shoes. Love the Moraine II, in pink! I love the Karl I dress shoes for boys! My son would love the Luke tennis shoes in Dark Gray Multi. I like Mack and Reece. My little one would love the Roxanne! I'd love to get the Luke boys shoes for my son. they really have a ton of cute option but my favorite are the girls dyan sandals in silver. i would totally wear them if them came in my size! One of my favorites is the Oliver! I like the Hector. So cute! My favorite style is the Ranna II ankle boots for girls. I like the Cassia shoe. My favorite is the Jules sandals, so colorful! i love the celia shoes. I like the Dyan II sandals. thank you! I like the girls Laraa in Black Multi color. I like the Roxanna B II. Those are so cute! I like the boys Dersent III! I love them all..but my fav is the Brooke. My favorite is the Weelie in Light Gray Multi. I love the Roxanna B 33433-432. My favorite are the Viola shoes, they are so cute! The Maddie shoes look very nice! The Eeva shoes are so cute! My daughter would love the Vena II sandals! I'd love to get the Luke boys shoes for my grandson.